materials: carbon, alloy, tft-monitor, cameras, solar panels, motors, sensors. 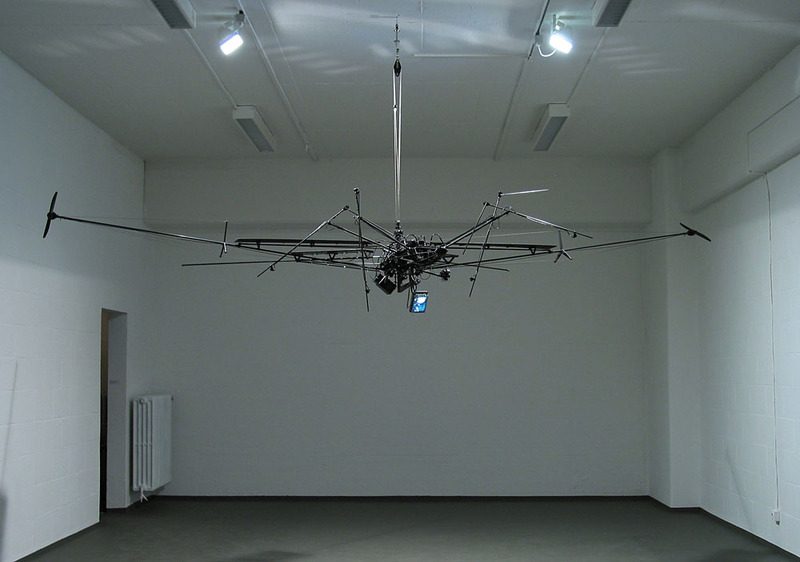 The futuristic appearance of "Drone #2" seems like a requisite from a science fiction film.The autonomous hi-tech construct, consisting of solar cells, heat sensors,propellors, videochips and a TFT monitor is suspended from the ceiling and reacts to the "warmblooded" spectator without him or her being able to directly influence its movement. This construction, at first glance finely structured and fragile, mutates, once activated, into a menacing surveillance apparatus whose function is nothing but permanent observation.